Adath Israel mourns the loss of our loved ones. Your community is here for you in your time of need. When death occurs, please call the synagogue at (860) 346-4709, so that we may inform Rabbi Haaz and assist you. Rabbi Haaz supports Adath Israel members during the difficult time when they experience a death in the family. Rabbi Haaz will conduct funeral services for Adath Israel congregants and their immediate family members and will provide the support that is needed during shiva and throughout the mourning period. When we are informed about the death of a Adath Israel family member a condolence email is sent to the Adath Israel community as soon as possible. Information about funeral arrangements and shiva plans will also be sent, if desired. Adath Israel provides siddurim, kippot, and other necessary supplies for shiva minyanim. Most funerals for Adath Israel members are coordinated in close cooperation with Doolittle Funeral Home, which is located just down the street. All Adath Israel members are entitle to burial in the Congregation Adath Israel Cemetery located on Pine Street in Middletown, just a five minute drive from the synagogue. Members can request the original synagogue section of the cemetery or the multifaith section that was dedicated in the summer of 2013. According to Jewish tradition, the laws of mourning apply to one who encounters the death of a parent, sibling, child, or spouse. While one may certainly grieve and mourn the death of other close relatives or friends, s/he is not obliged to observe the formal mourning practices. Shiva is the seven-day mourning period, observed by the family of the deceased, beginning on the day of burial and continuing for six additional days with a break for Shabbat. The purpose of shiva is to give mourners a chance to separate themselves from their usual activities and to spend time with people who share memories of the deceased, to gain comfort from loved ones and friends, and to leave time and space to allow the grieving process to unfold. It is usually observed in the home of the deceased or of a mourner and is designed to bring family members together at this difficult time for mutual support. • Shiva commences immediately after burial at the cemetery when the mourners return to the shiva home and partake of the Se’udat Havra-ah (the meal of consolation) , which is often prepared by friends, extended family and/or the community. The meal often consists of round foods (such as eggs or bagels) to symbolize the continuity of life. • It is also traditional for mourners to remain in the home, to sit on low stools, and to wear non-leather footwear. Mourners may also follow the traditional practice of refraining from the routine of daily life which includes washing themselves, changing clothes, combing hair, shaving and applying makeup. Mirrors may be covered in the house of mourning to take the focus away from outer appearances. • While it is a mitzvah to visit the mourners and bring food, it is important that the condolence visit not become a social occasion. Visitors extending their condolences are encouraged to sit quietly, allowing the mourners to set the tone. It is customary to extend condolences, but to wait for the mourners to initiate further conversation. It is not appropriate to give greetings or salutations or to ask questions as to how the mourner feels. 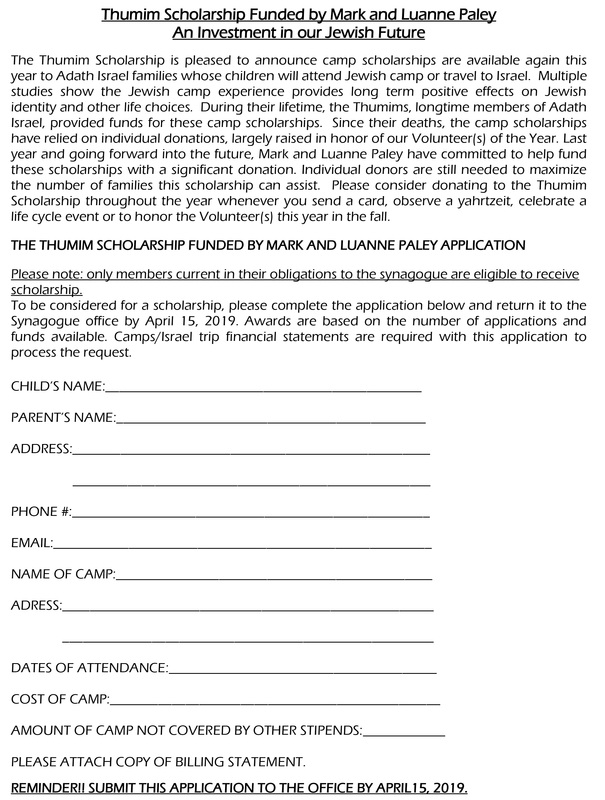 • In lieu of flowers, it is appropriate to give tzedakah to an organization that has meaning for the mourners and/or the deceased. • During shiva, mourners recite the Kaddish at morning, afternoon and evening services. Adath Israel’s daily morning minyan is open to mourners wishing to pray and recite the Kaddish. Adath Israel provides minyan leaders and participants for an evening minyan at the shiva home. Hamakom yenahem etkhem betokh she-ar avelei tziyon virushalayim. May God comfort you together with all the other mourners of Zion and Jerusalem. If a holiday occurs during the shiva week, please consult Rabbi Haaz to discuss the length of the shiva. The completion of shiva is observed with a walk around the block, the resumption of work and other regular activities following the minyan on the morning of the seventh day. For Jews, remembrance of the dead is a great obligation. This commitment is observed in several ways. Mourning is not completed with shiva, but continues for a total of thirty days from the day of burial during which time mourners recite the Kaddish daily. Although mourners are obligated to continue reciting the Kaddish for a total of eleven months from date of death only in the case of a parent, one may choose to do so for other relatives. The recitation of the Kaddish helps mourners to reconnect with the Jewish community, giving continuity to our lives during this difficult period. During shloshim, mourners return to work. Traditionally, they do not attend parties with music and dancing, other forms of public entertainment, shave or buy new clothes. When mourning a parent, there are some restrictions that continue for the first year. Someone on the Hevra Kadisha committee will call mourners at the end of the shloshim period. Yahrzeit (the anniversary of the death) is observed by lighting a special candle that burns for twenty-four hours on the eve of the actual date by the Hebrew calendar. Adath Israel will mail you a reminder so that you may attend the morning minyan and recite the Kaddish. You will also be invited to participate in a group aliyah on the Shabbat closest to the actual date. It is also customary, if at all possible, to visit the gravesite on the yahrzeit. The unveiling, when prayers and reading are recited and a headstone dedicated, is customarily performed prior to the first anniversary of the death although it can be done at any time after the conclusion of shiva. The Yizkor Service is held four times each year – on Yom Kippur, the last day of Pesah, the 2nd day of Shavuot and on Shemini Atzeret. It is customary to light a Yahrzeit candle at home on the evening prior to these holy days and to visit the cemetery prior to the High Holy Days. It is traditional to give charity at this time in memory of all the dead, not only one’s own family and friends, but of the larger Jewish community as well. Jewish tradition teaches that life is a blessing and a gift from God. We must therefore value life and respect our bodies. Although we have the responsibility to care for ourselves and seek the necessary medical treatment, modern advances in medicine and its practice have raised many new questions. In addition, they allow each of us to participate in the decisions regarding our own health care. Should we lose the ability to make those decisions, it is important for us to make our wishes known in advance. This can be done through a health care proxy, or durable power of attorney for health care, which allows you to designate a health care agent to make decisions on your behalf. An instruction directive, or “living will,” asks that you state your preferences regarding types of treatment decisions that may arise. These and other documents are available from the Rabbinical Assembly. Since decisions of this sort should not be made in haste, you may wish to discuss the matter with the rabbi.